To this day I regularly wear a t-shirt that on the back sports every single show Black Rebel Motorcycle Club played until that EU tour. Yes, I lost sight of the band every once in a while, but I did like its former album, 'Specter At The Feast', reviewed on this blog (read here: http://wonomagazine.blogspot.nl/2013/04/specter-at-feast-black-rebel-motorcycle.html). The t-shirt's just remains cool to wear. 'Whatever Happened To My Rock And Roll (Punk Song)' is the song that attracted me to Black Rebel Motorcycle Club back in 2001(?). The song at the time wasn't fully representative for the band and it never has been since. It may forever remain the best song BRMC wrote and will write. At the same time it is fair to comment that it's impossible to write many songs like it. So propulsive, so powerful and demanding. They just do not come that often. Now some four years and some after releasing 'Specter At The Feast' the band returns with Wrong Creature. BRMC starts out with familiar sounding tunes in the muddy, slightly psychedelic rock sound of the band. Come song 4, 'Haunt', the tempo goes down and a Madrugada kind of mellowness unfolds itself. The guitar has that longing sound. It is the environment that remains muddy, a large difference with the former Norwegian band. In the opening songs BRMC lays down its signature sound very convincing. In other words the pause of several years has done the band good. The fact that 'Haunt' takes the mood down and is simply a fine song pushes Wrong Creatures in the right direction. From that moment on things change though. The album has transitioned to a mid-tempo chugging along thing. BRMC skates on very thin ice here. To keep the album and individual songs alive it has to work with dynamics a lot, as the songs itself are not enough once I'm into the third one. And that is exactly what happens. 'Ninth Configuration' goes off in a fantastic way. Layers of guitars are spewed over the unsuspecting listener making the song as alive as an electric eel and as difficult to firmly grasp. What BRMC is good at is creating an atmosphere in its songs that are spell-binding. Without having to resort to too much effects to take a listener to musical pastures long gone, as many bands tend to do these days, BRMC presents its own musical universe. (Writing this conclusions a sitar enters in 'Calling Them All Away', so here I go. In general I stand by this conclusion though.) The murky, muddy, dark sound, of songs that may not necessarily be complex as compositions. It is within these limiting confines BRMC starts exploring the limits of these compositions and usually finds the outer edges, presenting yet another melody on the guitar or a keyboard, adding an extra layer of guitar, playing a different melody over the others once again. And they all fit. Just listen to what happens in the second half of 'Calling Them All Away' and find that my theory stands. This is BRMC in a top form. In fact, when thing go wild in 'Little Things Gone Wild' it comes almost as a disturbance of the peace. Somehow the song sounds a bit forced. Wrong Creatures returns to form though, leaving me with very little to complain about. It all ends with 'All Rise', a song that atypically starts with a piano, has strings in it, but slowly is brought to a befitting BRMC climax. A nice way to end this album. 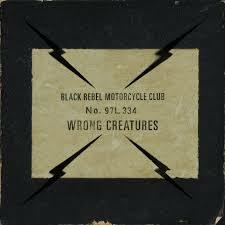 Wrong Creatures is the 8th album of BRMC and a fine one at that. It looks like it is time to let that first and most famous hit of the band be what it is, a fine song of the past. This attitude makes me expect less and enjoy the present more. As there is more than enough to enjoy on Wrong Creatures. Welcome back, Black Rebel Motorcycle Club.